Of all the world’s many and varied spices, the delicious ginger root may be the most versatile, flavourful and widely used around the world today! Harvested from plants in the tropical Zingiberaceae family, most of the world's supply is grown in China, India, Indonesia and Nepal. Click the Thumbnail Images, or see the bottom of the page, for more on the health benefits, plant info and tips on growing and using in your home cooking. 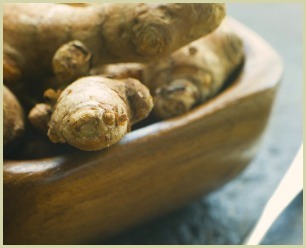 Ginger Root - Super Tasty and Very Healthy! There are multiple ways of using the root. You can use it fresh or dried, pickled or crystallized and ground or candied. And you'll find it used in starters and appetizers, main courses, desserts and puddings. When cooking, I usually just use the fresh root or ground powder. Fresh is excellent in most curries and stir fry recipes and I nearly always use the ground powder in my curry powders and masala blends. As I mentioned above, as tasty as this spice is, there are also numerous health benefits, which is another excellent reason to get more of it into your diet. Note: If you're feeling adventurous and live in the right climate, you could always have a go at growing it yourself. Click here for step-by-step tips on this.